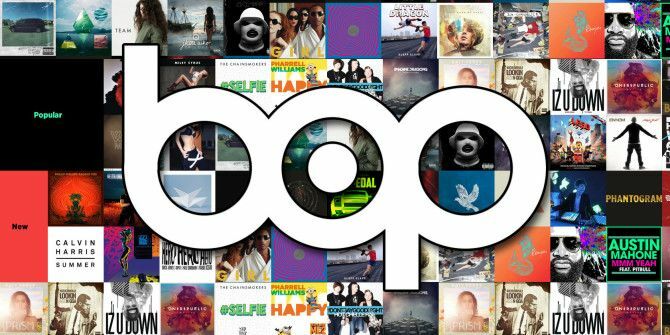 Bop.fm is a music aggregator that stitches together music from different services like such as Deezer, Spotify, Beats, Rdio, Soundcloud and YouTube. Thanks to Bop.fm, you can hurdle over regional restrictions Bop.fm: Why Let Region Restrictions Stop You From Sharing Great Music Bop.fm: Why Let Region Restrictions Stop You From Sharing Great Music The idea of a universal playlist free from regional restrictions of music streaming surely has struck most of us at one time or another. This new music streaming website turns it into a reality. Read More while sharing songs across the services. Now with the new Playlist Grabber feature you can aggregate not only songs as before, but also entire playlists while sharing them with the same ease. It’s being called the “Switzerland of digital music”. Bop.fm aggregates music from the music services and acts as an automatic bridge when one friend wants to share a song with someone who uses a different service. Bop.fm does not host any songs itself, but uses the APIs. With a sign-up, you could create your own shareable playlists on Bop.fm. But now as an added feature, you can import your original playlists if you are on the music sites supported by Bop.fm. For instance, you can import your playlists from Spotify and share it across Twitter, Facebook, or any other media with just a URL. Anyone with the URL can then listen to the songs on your playlist. If any song is not available on the listener’s music streaming service of choice, Bop.fm tries to provide an alternate source (for example, YouTube). The playlist feature is available for Rdio and Spotify users to begin with, but will gradually cover the remaining services. The Playlist Grabber is a timesaving improvement because with easy import of your carefully curated playlist, you don’t have to bother about creating another one. Friends also get to share your music tastes in one bunch of songs rather than listening to them piecemeal.